HAPPY HOMECOMING, To all my FISK FASHIONISTAS AND FRIENDS! It’s another HBCU Homecoming week, and I know this one will be quite nice, as the Fab Fans at Fisk know how to have fun. Although I am an Alumni of Tennessee State University (what you didn’t know) I remember plenty of times partying it up in Fisk’s Gymnasium. Actually those were some pretty great parties. Plus, if you are a member of the Divine 9, FISK has an excellent Fraternity and Sorority Alumni Culture; I know these organizations will host some great events. FISK Alums can check the www.fiskiteroundup.com for more event details. 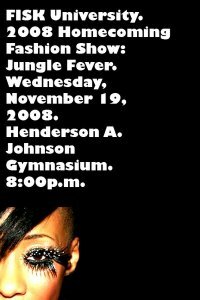 Of course, your Fab Girl, Ms. Lyssa, will be at the 2008 Fashion Show. The theme is Jungle fever, so you know it’s gonna be a spectacular sight! Hope to see you there!